Fajita Steak Soup is so flavorful and simple to make! 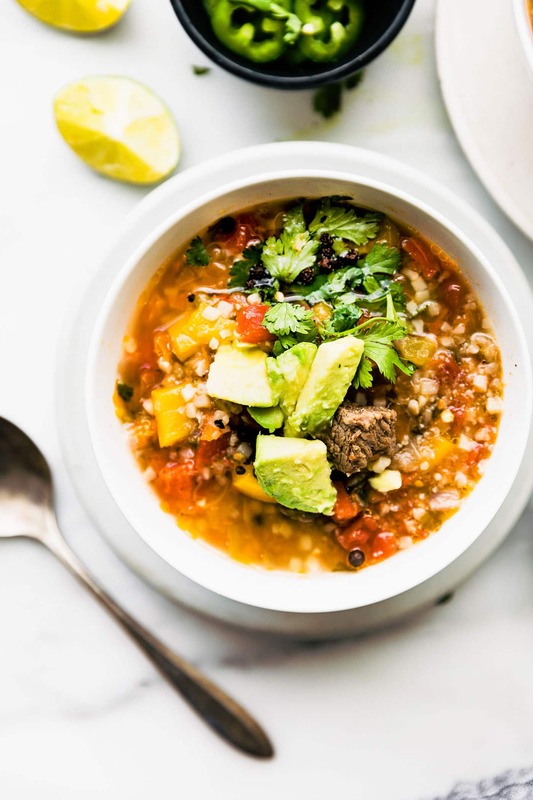 This healthy Mexican-inspired soup combines the flavors of lean beef, peppers, cauliflower rice, onions, and tomatoes. 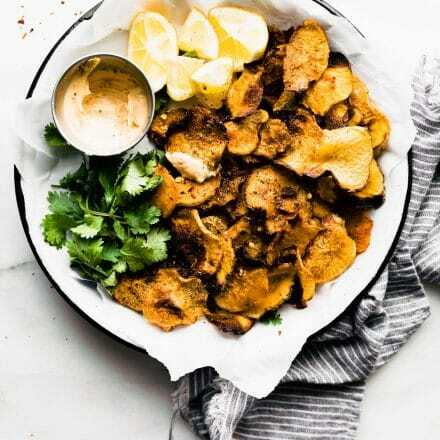 Paleo and whole30 friendly ingredients, light, and quick to make in the instant pot or stove top! It’s cold. There’s a blizzard. We need soup; spicy fajita steak soup! The meal prep challenge may be over, but I still find myself thinking in that matter. Meal prep that is. 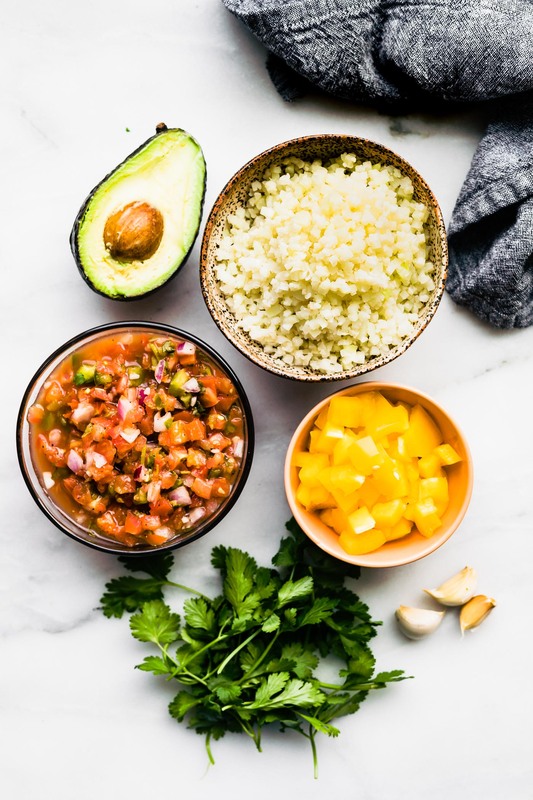 Easy to prep and easy to make recipes! 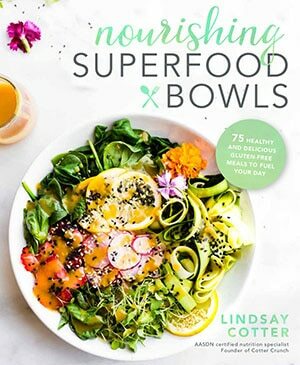 Recipes made with simple nourishing ingredients. Yes, SIMPLE yet Flavorful. I guess that means the anti-inflammatory meal prep challenge has had a lasting effect on me. Do I get bonus points for that? Haha, no, but if you practice something on a consistent basis, it becomes a habit! And I plan on making meal prep a HABIT! AMEN AMEN! 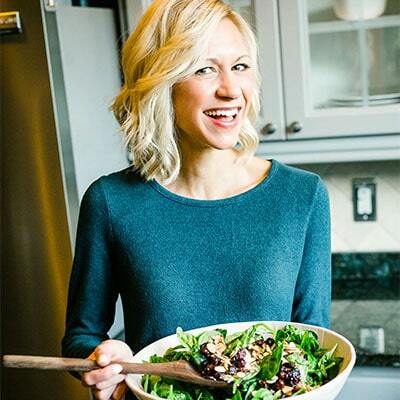 So there I stood Sunday morning… standing in my kitchen planning for Sunday dinner and a few meal prepped lunches for the week. It was cold. It was snowy. And the only thing on my mind was a spicy soothing soup. One that you could batch cook and freeze. You’re thinking exactly what I’m thinking (or was thinking that day), yes? Mexican FOOD made in the instant pot (or stove top). But not just any mexican recipe, an extra spicy beefy fajita-ish recipe! 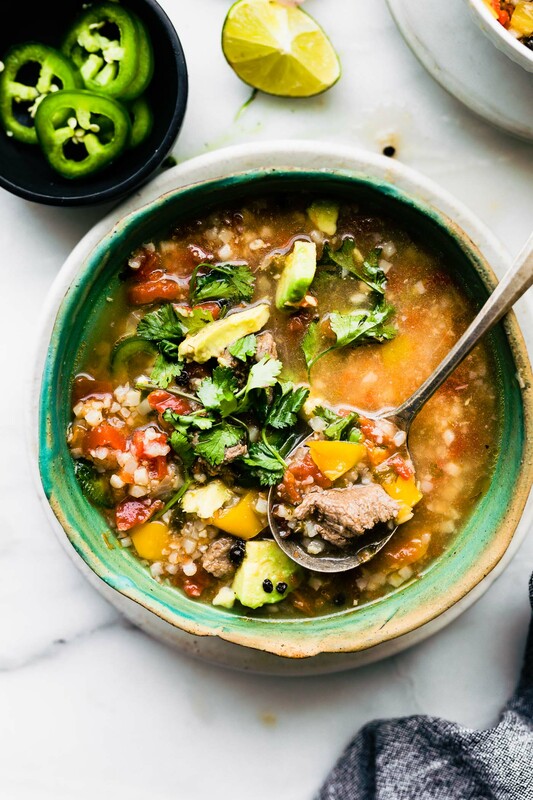 INSTANT POT STEAK SOUP with a MEXICAN FAJITA Twist! A pressure cooker recipe for steak fajitas in a spicy soup form. But remember, there a STOVE TOP OPTION TOO! 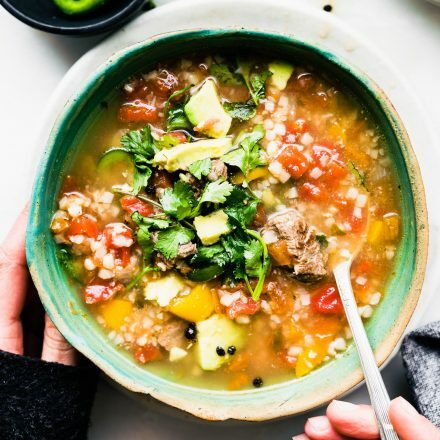 So even if you don’t have an instant pot (yet), you can make this soup. It’s a must must must make! 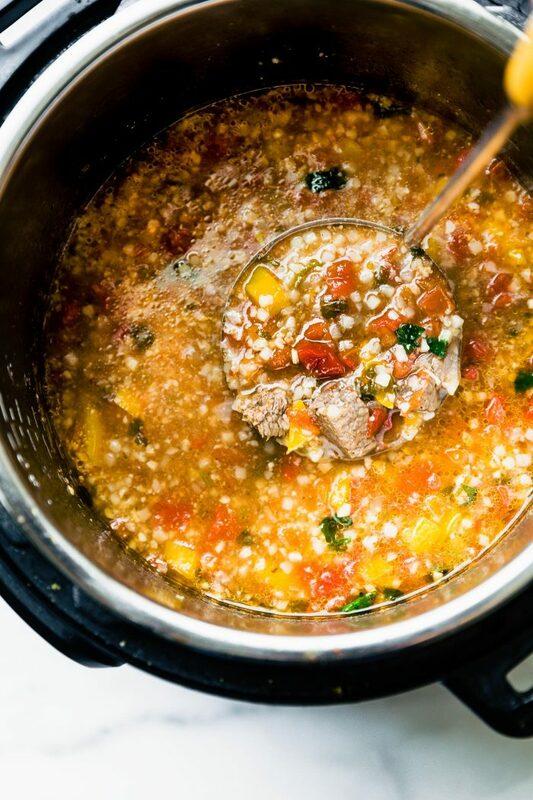 Quick note —> If you ever want to practice to searing steaks, you can practice by making this Mexican steak soup. How so? Well, in order to make the soup I first seared (browned/sauteed) lean steaks in the instant pot. All you do is add a bit of oil and pepper. Use the saute mode (or medium high on the stop top) to cook 2 steaks, flip a few times, then remove from heat. Let the steaks rest a bit while you prep the other ingredients. Then slice and sprinkle with sea salt. Taste if you’d like! Then, once you have everything prepped for the soup, simply throw it all back in the instant pot or stock pot to cook, including the steak strips. So you see, even if you mess up searing steak (which is really just as easy as searing salmon), you will have use for it. Okay let’s talk about what’s in it and a nerdy nutrition tip. Mmmmk ? Lean beef (steak sirloin) – Good source of lean protein and heme Iron. Cauliflower rice (always handy) – Cauliflower is also rich in Vitamin K, which can improve bone health by improving calcium absorption. Onion and garlic- Garlic may have the ability to help lower the bad LDL cholesterol while not affecting the good HDL cholesterol. Diced Tomatoes – Rich in lycopene (antioxidant that supports skin and immune system). Chicken Broth – If you add bone broth to the soup, you’ll sneak in extra protein, Plus the collagen and amino acids are great for gut health. 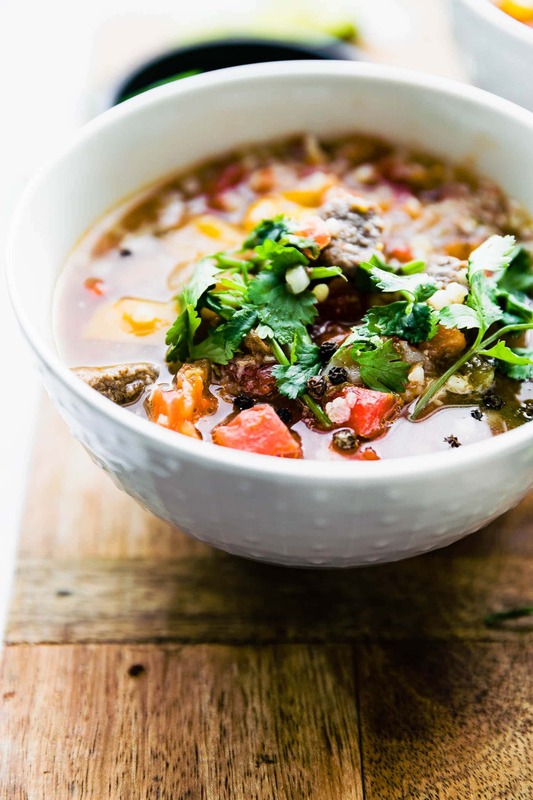 I realize you may be thinking… this is such a hodge podge Mexican beef and vegetable soup. To which I would then respond….. YES! And one you will your taste buds will forever remember! Now, someone please trademark that name. 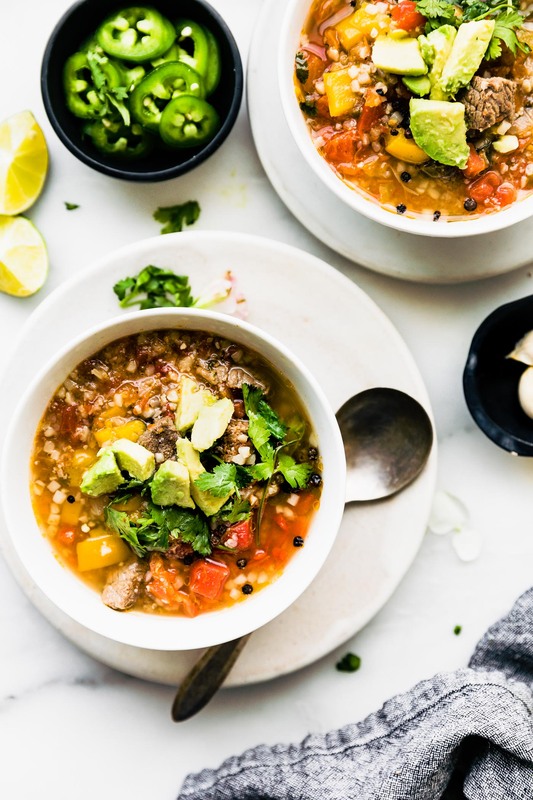 Healthy fajita steak soup (instant pot or stove top)- A mexican inspired paleo soup that’s easy and delicious! Whole 30 friendly. 12 ounce steak (trimmed, fat removed) (or two 5–6 ounce steaks)- See notes for other options. Clean and remove fat from steaks. Make sure all your other ingredients are diced and ready for the soup. Set aside. Place instant pot on sauté setting. 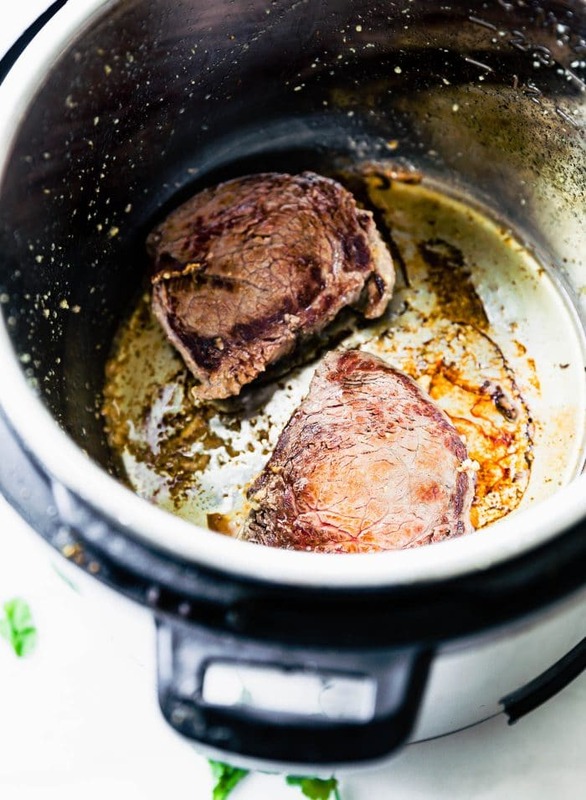 Place your steak, garlic, and oil in the instant pot. Brown meat with garlic and oil on sauté for 2 to 3 minutes, flipping once. Remove from instant pot and let the steak rest for 2 minutes. Then Slice into stew meat pieces. Place the meat back in the instant pot and then add in the rest of ingredients and spiced, mix together. Place lid on instant pot then press Manual mode pressure cook. 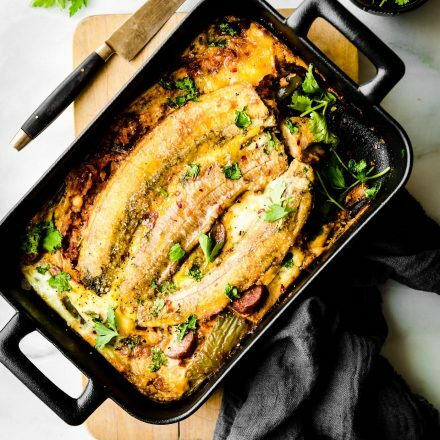 Cook for 15 min, then slow release. Quick release works just as well. Stir ingredients. Taste to see if it’s to you liking. Add more spices while it’s warm, if desired. 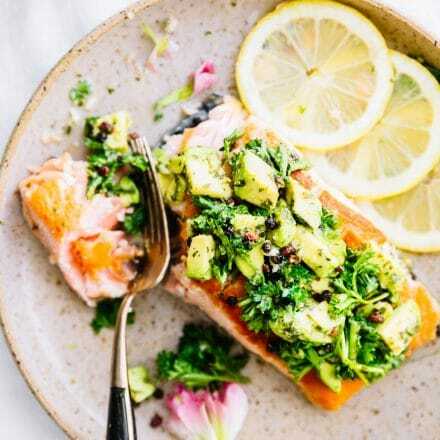 Serve hot and garnish with torn fresh cilantro, jalapeño slices, avocado slices and peppercorn. Heat a large stock pot to medium. Add steak meat (or stew meat) and brown with oil and garlic. Slice meat once browned and rested for 1-2 minutes. If you’re using stew meat, skip the resting. Add your vegetables to the pot, sauté for 2 minutes on medium. Next add the sliced steak meat back into the pot along with spices, broth or stock. Cover with lid and set to medium low for 30 – 35 min or until meat and vegetables are cooked seasoned well with the broth. Taste and adjust if needed. SEE NOTE FOR STORAGE. This soup does freeze well. If you wish to skip searing steak fillets, you can buy stew meat already sliced and brown it in instant pot. Store in airtight container in fridge for up to 7 days. Or freeze for 3 months. If you’re wondering how to rice cauliflower, see my cauliflower rice soup recipe. Or you can buy prepared cauliflower rice in the freezer section! What are you making today? I’m hoping it soup! Stay warm and toasty my friends! Wow! 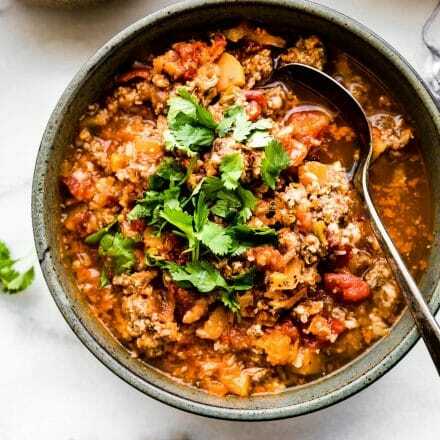 Definitely the perfect protein-packed, hearty, warming meal to combat the scary weather (it’s -1*F here today. Note the negative sign). OMG -1? Come visit! I’ll make you soup! Got it! I think you could fix it the same way but without brownies the shrimp. Just make sure to add in the garlic too and then pressure cook for 15 minutes. Make sense? If shrimp don’t cook all the way through, just keep on warm until they do. But they should! Putting this one on the menu this week- looks delicious. As usual, totally stunning photography! Thank you friend! Keep me posted. Fajita soup!? SO. MUCH. YES!